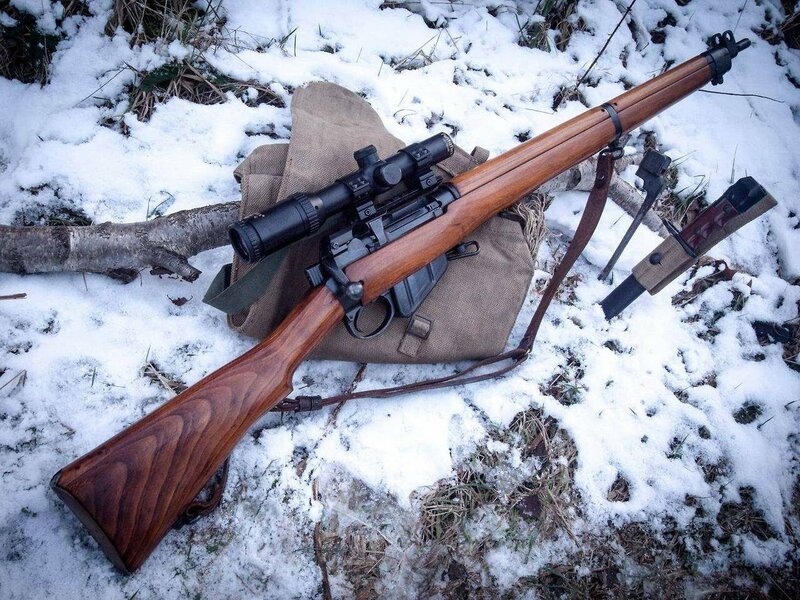 Description: A-021 is a Lee-Enfield No.4 Mk1 (T) sniper rifle, manufactured in 1943. Markings on A-021 suggest that it was not made at the Lee-Enfield manufacturing plant, but rather at a plant known as "Davidson-Brandi." No record of any manufacturer by this name has been discovered. The Phrase "Valentine's Enfield" is engraved into the left side of A-021's scope. When loaded with standard .303 caliber cartridges, A-021's anomalous properties will not manifest, leading A-021 to function as a non-anomalous Lee-Enfield rifle. A-021's anomalous properties will manifest when a variation of A-021-1 is loaded into A-021. A-021-1 variations will only function in A-021, causing a stoppage when loaded into a non-anomalous Lee-Enfield rifle. A-021-1 is a series of 5 .303 caliber cartridges, each engraved with a different phrase. When inserted into a stripper clip, A-021-1 instances will make 4 copies of themselves, as well as an additional stripper clip containing 5 copies. All A-021-1 variations produce no recoil when fired. A table of all variations of A-021-1 and their effects can be found in the table below. "Standard" No anomalous effects besides the ones previously mentioned will occur when the "Standard" variation is loaded into A-021. "Anti-Material" Upon impact with any surface, the bullet will cause the surface to disintegrate. "Incendiary" Impact will cause immediate immolation of flammable material. This also effects humans. "Tracer" Functions near-identical to the "Standard" variant, with the exception that the bullet will lock on to and hit a random individual within one kilometer of the shooter, with the exception of the shooter. "Explosive" Upon impact with any surface, the bullet will explode. This explosion is equivalent to that of the PG-29V anti-tank rocket of the RPG-29 "Vampir." Addenda-021-A—Discovery: A-021 was assumed to be discovered sometime in 1943, however, perhaps as a tactical decision, the British Armed Forces had not informed the Initiative until 2/██/1945. A-021 was officially discovered in London, England, when footage of the "Incendiary" variant of A-021-1's effects was sent to the Initiative. A single researcher was sent to retrieve A-021 and all instances of A-021-1. After doing so, A-021 and all A-021-1 variations were sent to Site-002 for storage. Procedure: 1 round of all 5 variations of A-021-1, as well as a non-anomalous .303 cartridge, were to be fired out of A-021. D-Class were used as targets. Results The "Standard" variant of A-021-1 and the control cartridge functioned identically. The "Anti-Material" variant caused the slow disintegration of the D-class. As this process happened, The D-class reported extreme pain. The "Incendiary" variant caused the D-Class it impacted to combust. within 2 minutes, the D-Class was reduced to ashes. The "Tracer" variant did not hit the D-class it was aimed at, instead hitting another D-Class Within a nearby containment cell. Finally, the "Explosive" variant was fired between the two remaining D-Class, killing both instantly. Incident: During a training exercise, an ISF sniper attempted to fire the "Tracer" variant of A-021-1 at a captured hostile prisoner, however, the cartridge had hit an ISF recruit instead. Fortunately, the recruit had been hit in the leg and had made a full recovery. As of this date, a new safety precaution has been established for the "Tracer" variant of A-021-1.